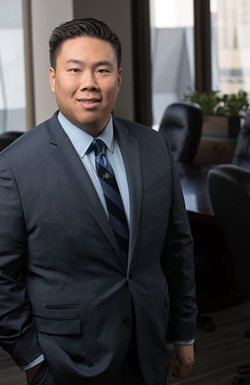 Vincent Wong’s practice focuses on commercial real estate and business transactions, including purchase and sales, construction and permanent financing, and leasing. With his experience representing developers and landowners, borrowers, and commercial landlords and tenants, Vince is knowledgeable about issues on both sides of the transaction. His clients also benefit from his environmental law, land use, and permitting experience. Vince was previously with the natural resources law firm of Mitchell Chadwick LLP, where he represented Fortune 500 energy and mining companies, developers, and large landowners. His practice areas included all aspects of CEQA, Clean Water Act permitting and enforcement matters, Streambed Alteration Agreements, Incidental Take Permits, and local land use matters. Vince received his J.D. in 2013 from the University of California, Los Angeles School of Law. Lead associate in conducting due diligence and other closing duties in investment fund’s purchase of a multi-million-dollar property for mitigation bank purposes. Representative transactions include: sale of several hundred acres of semi-improved property in rural Northern California, sale of hotel property in Davis, sale of sale of partially-entitled development properties in Placer County, and acquisition of stabilized commercial property in Roseville. Represented borrowers of construction and permanent loans for wide range of developments, including hotels, medical condominiums, mixed use, commercial, and multifamily projects. Negotiated 20-year industrial leases on behalf of two international corporations. Resolved CC&R disputes, including allocation and scope of CC&R passthrough costs. Negotiated lease termination agreements containing asset acquisition, liquor license, and bulk sale provisions on behalf of both landlords and tenants. Represented developer in mixed-use project spanning several hundred acres in Placer County. Consulted and negotiated with local, state, and federal agencies to entitle wide range of projects, including mixed-use developments, aggregate mines, and major subdivisions. Drafted conservation easements on behalf of landowners as well as mitigation bank sponsors. Assisted in the approval of a 4,000-acre mitigation bank in Los Angeles County, including the review and response to Interagency Review Team comments. Advised property owners on permitting efforts of a mitigation bank in Northern California. Lead associate in defending two Fortune 500 companies against groundwater and pipeline contamination environmental lawsuits. Advised clients on front-end CEQA compliance, including review of Environmental Impact Reports for industrial projects throughout the State. Settled an oil and gas royalty dispute with a monetary payment of ten percent of the original demand amount. Assisted in the successful defense of an air pollution agency’s approval of upgrades to an oil refinery. Supported successful permit revocation proceedings against a centralized waste treatment facility, including the assessment of a million-dollar penalty. Served as Deputy City Attorney and Assistant General Counsel to numerous public entities throughout Southern California, including the Orange County Sanitation District and City of Palm Springs.